March 2006: more than one night allowed. 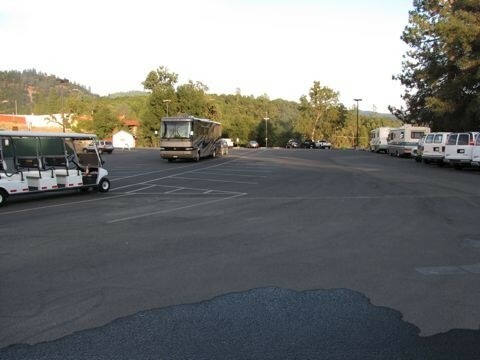 March 2006: Large RV parking area, shuttle service to casino, security patrolled. August 2018 stayed in their new RV park. Beautiful concrete slabs, wifi, water, sewer electric.. Easy guest transportation shuttle to casino and amphitheater venue. Friendly staff. Reasonably priced. Club house, pool, horseshoes etc. Security patrol met us on arrival and escorted us to a level parking area in front of the fire house. A new RV parking area is currently under construction, may open mid June. New members receive $25 players card, which we enjoyed immensely and profited from very loose slots. Various bars and restaurants to choose from although smoking is still permitted in Casino. RV PARKING LOT IS VERY SMALL- PROBABLY CAN’T HOLD MORE THAN 6 RIGS. Lot also used for casino vans and buses. Probably due to construction around the casino- have added a gas station and convenience store. Also multiple night stays. Employees very friendly. Had drinks, dinner and gambled. Players Club gave us $10.00 to play- 1st time visitors.. Drinks reasonable and the food was good. Buffet was $12.95- nice selection. Tuolumne town has basically no facilities- just a grocery store and bar. 8 miles outside Sonora on a rural busy road- saw lots of deer- beautiful country. Nearest Starbucks, pharmacy, McDonalds etc. 5 miles back in the same road.